Hypogean Gaol is a location in Bloodborne, a subsection of Yahar'gul that can be accessed before the main quest takes the Hunter there. The Lamp to this location becomes unavailable after the player advances past Rom, the Vacuous Spider, and stays unavailable for the rest of the game. 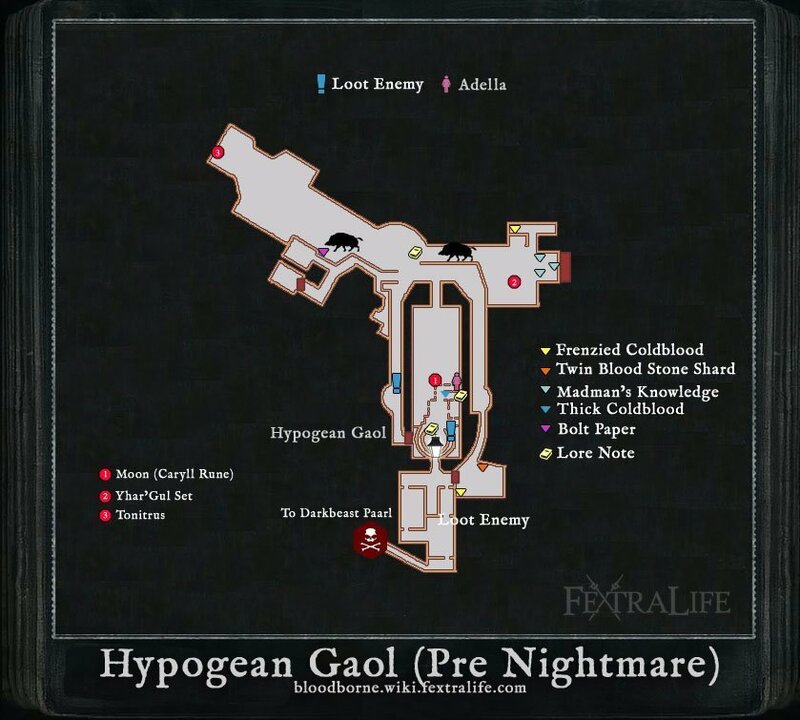 While not a 'true' area of the game as it is labelled as Yahar'gul, it is called the Hypogean Gaol to differentiate it from the later part of the area. Note by the spawn point cell reads: "Madmen toil surreptitiously in rituals to beckon the moon. Uncover their secrets." Note by first Lamp reads: "Nightmarish rituals crave a newborn. Find one, and silence its harrowing cry." Note by the stairs leading to Yahar'Gul Set reads: "Behold! A Paleblood sky!" After defeating the Blood-Starved Beast, you'll be able to encounter a Snatcher; you must die by a Snatcher's hand to be thrown into his sack and trigger a small cut-scene ending with you standing alone in an unlocked cell. Exit your cell through the unlocked door and head right to find a staircase -you should find a corpse with Thick Coldblood(6) as you approach these stairs- leading to a dead end room containing the praying/hidden woman, this is Adella. While she is an interactive NPC, it only works if you seem as though you represent the church. Achieve this by equipping one of the many church-related garbs or sets, such as the Black Church Set, or even Gascoigne's Set. 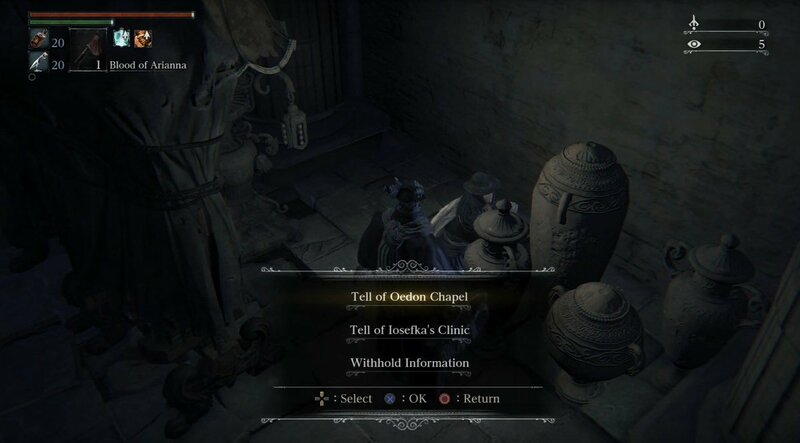 Speaking to her will hand you some tasty lore, and the option to send her to a safe passage - there are more benefits to sending her to the Oedon Chapel. Also find Frenzied Coldblood(7) in this area. Head back up to the cell and continue past it to find a small staircase with four accessible floors. It is recommended that the player sprint to the fourth floor of this staircase and light the Lamp before attempting anything else, as the Snatchers are capable of one-shotting most players at this point. The Lamp rests atop the spiral staircase, and will act as the center point to this area. Upon first using the Lamp, only the chapel is available. However on both sides of the Lamp, there are doors that can be opened from outside, providing a faster route through the area. On your way up, you'll find a Scurrying Beast if you take the stairs on your left, kill it to reap its reward. The doorway on the second landing of the spiral staircase leads to a small room in which an enemy is seen running across the doorway. As you may guess, this is a trap. As soon as you turn to attack the enemy you just saw, a second enemy lies in wait to the right of the doorway. 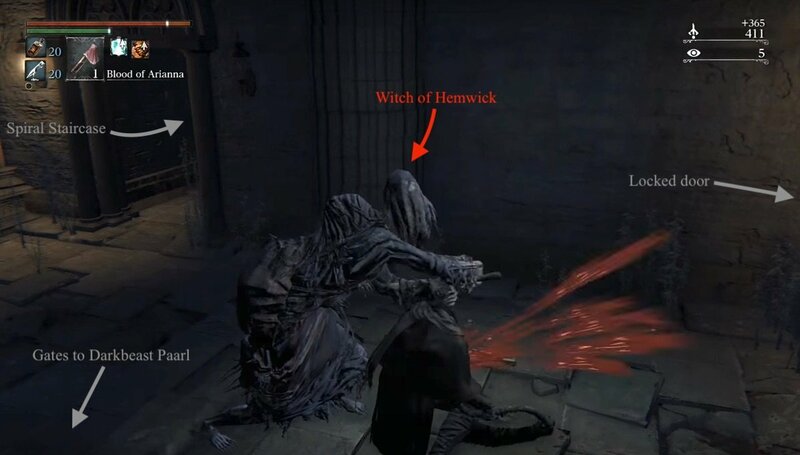 These enemies are known as Witches of Hemwick. Letting either enemy land a back attack will result in a drawn out death animation, in which one enemy cuts your throat and the other beats on you. The best thing to do in this situation is to, instead of making a sharp left and attacking the first Witch immediately, run through the door to create distance from yourself and the Witches' grab attack, then manoeuvre around to deal with them 1-on-1. In this room a door on the left cannot be opened, but can later be accessed from outside the Chapel. After disposing of these two enemies, the player can progress into the room and deal with the corpses on the floor, which can be easily dealt with in three or four hits, proving very little of a challenge. Be sure to pick up the 6 Blood Vials and 10 Quicksilver Bullets from the corpses that are actually dead in this area. Do not enter the doorways in the back left and right of the room, as behind these doorways reside two very strong enemies that can one hit lower level characters. However when you do, past the gates are two Snatchers standing at a table. 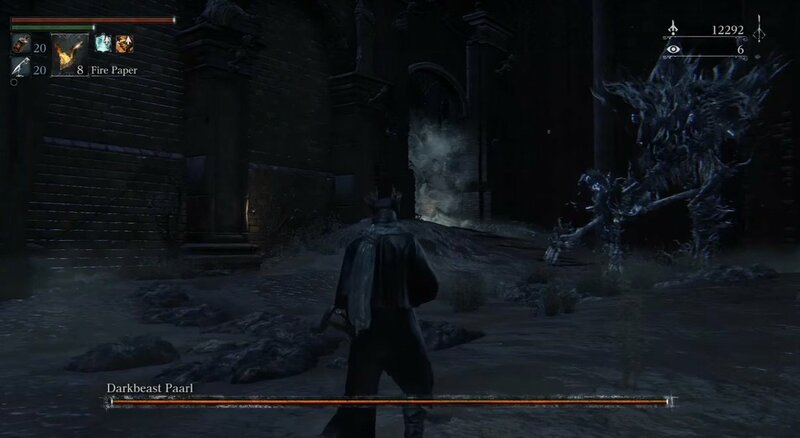 Upon defeating these enemies or choosing to move forward, the player will have to drop down a ledge and engage the boss of the area, Darkbeast Paarl. Killing this boss will open a door to lower Old Yharnam. If you want to complete Djura's Questline, you do not need to defeat Darkbeast Paarl, you only need to witness it to gain the specific insight needed to complete his questline successfully. So if you fancy doing that but you're not strong enough to take Paarl on, simply enter the boss area, aggro Paarl, then use your Bold Hunter's Mark to escape. 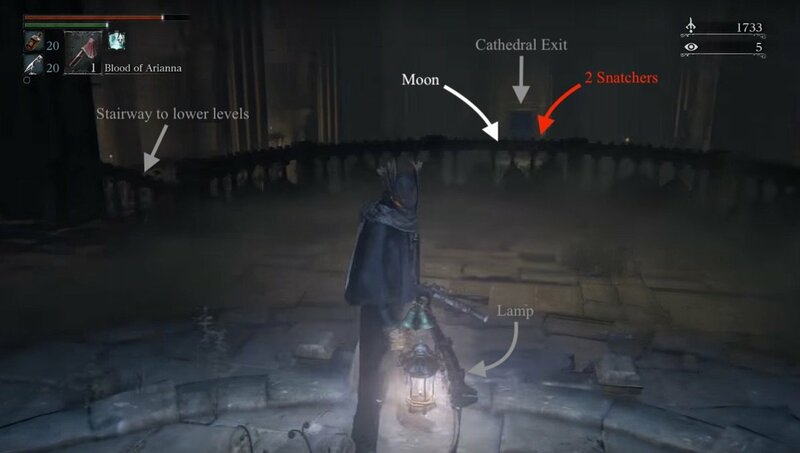 The ground floor of the area -the level that is just below the little balcony with the lamp from earlier- has two Snatchers guarding a Moon drop, in the middle of the floor of the cathedral you are in, and another Witch behind a pillar on the right. 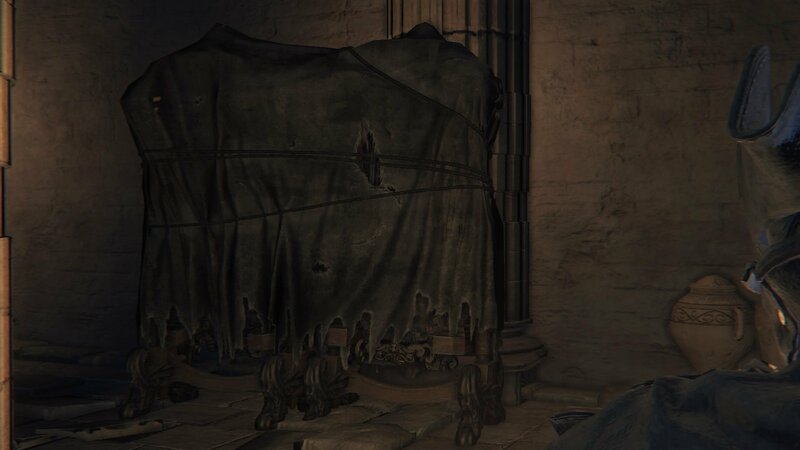 Upon leaving the cathedral, the player will be presented with what appears to be the ground level of Hypogean Gaol. To the immediate right there is a path leading down to the door to the room leading to the area boss, as well as a Snatcher and two Rabid Dogs. 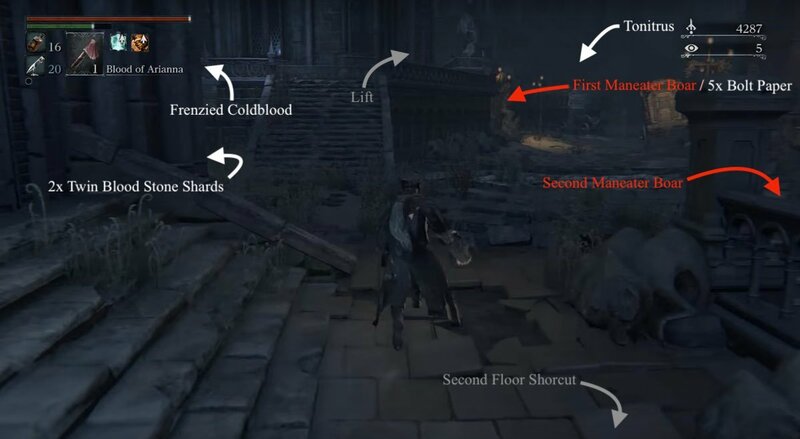 Continue straight down the corridor and stairs, then turn left to pick up the Twin Blood Stone Shards and a Frenzied Coldblood in this area too. You can also open the door down here and it will take you to the room where the two Witches planned their ambush on you. If you go back to the cathedral doorway you exited earlier, and continue the other way. Turn left into the first corridor possible and kill the Wandering Madness in the middle of the corridor for 2x Twin Blood Stone Shards. Follow this path to the end to open up a shortcut to the lantern you lit. Head back out the corridor to the open area and up the stairs to your left. Turn left once again to pick up a Frenzied Coldblood(8) behind a wall. Head back and towards the other direction on this platform to find a doorway on your left that will lead to a lift which we will leave for now, and instead climb the stairs again so you can roll onto a carriage and avoid damage from the 2 Maneater Boars and multiple Rabid Dogs in the area below. A good way to deal with the dogs of this area is to expend a couple of Pungent Blood Cocktails to gather them for easier an easier dispatch via your weapon or Molotov Cocktails. Avoid the pigs while you do this as it makes your flight a whole lot harder if you aggro them. Once the Rabid Dogs are defeated, engage the pig under the walkway first, as this one guards some very useful 5x Bolt Paper. At the far left of the area (coming out of the cathedral) you'll find another 2 Rabid Dogs and their Snatcher master guarding the Tonitrus, a very good mace. You can defeat them to obtain it but if you would rather not, then the very useful Pungent Blood Cocktails can come in handy to lure the puppers away momentarily. The second Boar hides on the downward staircase on the right side. Defeat it to gain access to a very lootable area with 3 more Rabid Dogs. Find 3 Madman's Knowledge on corpses triangulating each other at a currently unmanageable door, the Yahar'gul Set on a coach driver on the carriage, and climb the stairs on the right of the doors to find a Frenzied Coldblood(8) on this balcony. I was transported here via snatcher the first time, but after killing the darkbeast paarl i was unable to access it again via snatcher. Is it locked now or am i just missing something? How do you get to use that elevator after goin outside past the two snatches guarding the moon runee going to the left and following the path ? If you leave this area via the lamp, how do you get back? Or can’t you? "Gaol" is not Old English, it is Modern English, and the spelling is simply considered dated. Explaining the name is pretty retarded since both words are currently in use. Bactefort ist in der Lage den menschlichen Körper vor Parasiten, Spulwürmern und Helminthen zu schützen. Dies wird mit echten Bewertungen über Bactefort in den Kommentaren bestätigt. Die Effizienz des Mittels ist mit einem entsprechenden Qualitätszertifikat bestätigt worden! Wo ist Bactefort erhältlich und Preis des Medikaments. Wir möchten Sie sofort darauf hinweisen, dass die antiparasitäre Tropfen Bactefort neu auf dem Markt sind und noch nicht in den Apotheken erhältlich sind. &lt;a href=https://produkt-bewertung.com/eco-slim-2018-test-bewertung-erfahrungen.html&gt;produkt-bewertung.com/eco-slim-2018-test-bewertung-erfahrungen.html&lt;/a&gt; Entzündungen werden wirkungsvoll gelindert, ebenso Schwellungen abgebaut. Da es speziell bei diesen Krankheiten immer zu einer Degeneration kommt und diese im Regelfall auch schnell voranschreitet, verlangsamt das Gel ebendiesen Prozess und trägt dazu bei, dass sich das Gelenkgewebe besser regenerieren kann. Gelenkserkrankungen und sogar Wirbelsäulenerkrankungen werden dadurch erheblich verbessert. Wissenschaftler haben creme Psorimilk, die behandelnde Schuppenflechte und Erleichterung von seinen Effekten nicht auf dem kurzen, und für die lange Sicht geschaffen. Der Einfluss dieser Vorbereitung auf dem Organismus ist mündelsicher. Wenn die Person die beschriebene Krankheit heilen möchte, dass die Bedingung der Haut ideal war, sollte es gerade verwenden das bedeutet. Wie ist der Psorimilk Preis? Auch der Preis, der viel verfügbarer ist als die Kosten anderer Vorbereitungen behandelnde oder viel versprechende Behandlung von dermatosis, wird Käufer erfreuen. Can you use the 2 pigs the ram in the the wall with the snatcher? I&apos;m done for, after got kidnapped by snatcher I just didn&apos;t notice staitway to lamp so I didn&apos;t activate it, but instead I went and kill Paarl, can&apos;t return to this place before blood moon for me. Go to the top floor of where you were captured at and you&apos;ll find a lamp there. It&apos;s above the level where two snatchers are roaming. Teleport back to hunter&apos;s dream from there. I got captured and tried fighting Paarl. Ran out of supplies so I went to farm and tried to come back, Cant teleport back. Super mad. Just a question about the giant lamp things. It could be just a coincidence that the “Madmen toil surreptitiously in rituals to beckon the moon. Uncover their secrets.” message is right in front of one, but is there a reason for these lamps? I killed rom before the blood starved beast can i still get to this area? I have a question regarding the hypogean gaol : When I first played the game I came here and after you rescue the Adella the nun, a Scourge Beast appeared in the same area as the cell where you started the level, but playing a new run of the game it appears that he doesn&apos;t show up anymore. Was he patched out or something? This is my favorite farming area. Around 25.000 echoes in 4 minutes. How I can get to there again? Sincerest thanks. So I proceeded to ng+, one of the things I rushed was to get to gaol to get the brush off dust gesture from the old yharnam npc. I woke up in gaol and went to the boss and killed him and got the gesture. I forgot to light the lamp and I want to return to get adella the nun. I got killed by a snatcher again but wont work. Is there anyway to get to there? I think going from where the darkbeast was won&apos;t help as there was a drop before the boss? Adella the Nun also spoke to me while I was wearing Father Gascoinge&apos;s garb. Ok, so I lit the lamp at the top of the stairs and later used it to go back to hunters dream to buy supplies, but I can&apos;t seem to return. There&apos;s no option at the gravestone and the snatchers do not take me back either. why? The last boss I beat was the blood starved beast, my insight is at 15. Any help, I want to finish exploring, I never got past that pig. And I want to fight that boss. Personally, I think there should be two pages. The pertinent information is totally different: the means to get there, the enemy layout, the NPC, and the boss. The wiki should have two pages containing the relevant info for where the person is, as described by the Lamp. So... The door to the catedral is shut. I can&apos;t get it open. The "open" bottom dont appear to me. Is that a bug? Im stuck in this part until From fix it? Where is the enemies with the bags on their shoulder in Cathedral Ward? I do not find it , or it does not appear to me !!! This is actually an incredible source of early income and blood stone shards/twins. The Snatchers do a lot of damage, but because they&apos;re so slow and telegraphed getting a weapon with a high range and stagger V-Attack like Ludwig&apos;s Sword, Axe, or even Stake Driver makes them really easy to farm when you get used to it. 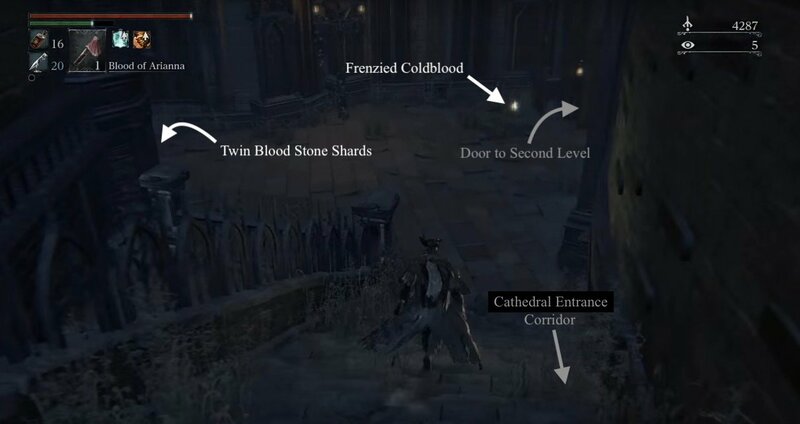 They drop a relatively large amount of blood echoes for the point of the game you can get taken here, and they drop blood stone shards and twins with every kill so you can easily get weapons to +6 before even killing Vicar. Definitely an early farming spot for players to take advantage of should they choose. So is there any path to get to Hypogean Gaol after Rom is dead or is it just not possible anymore and I don&apos;t get to fight an optional boss?